It looks like a typical learning fair. 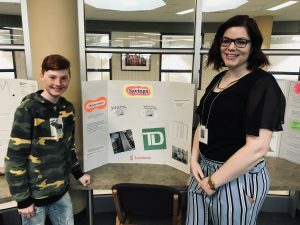 About 40 Clarington students have set up Bristol board presentations and teachers from schools across the area are milling about asking them questions in the learning commons of Holy Trinity Catholic Secondary School. But the target “learners” at this event are the educators themselves. In smaller groups, students are taking teachers through their Deep Learning inquiry process and explaining why the approach sparked their attention and made their learning more meaningful as they tackled issues ranging from social media safety, to female empowerment, to climate change and financial literacy. The students have been brought here to teach educators who have an interest in Deep Learning but have yet to implement it in their classrooms. It’s the first Deep Learning Expo of its kind. One expo will be held in each jurisdiction of the Board between now and the end of the school year. “Students that have been using the Deep Learning process to explore topics of interest are now teaching other educators more about the process and how it can be used in the classroom,” explained learning consultant Heather Michel, who adopted Deep Learning in her classroom and is now promoting that experience as a system leader. In the Deep Learning approach, the teacher empowers students to take ownership of a lesson, facilitates student-led inquiry and creates partnerships in the community so that students can take action on an important local or global issue. But because Deep Learning requires a different approach in the classroom, educators can be hesitant to give it a try, Michel said. That’s why opportunities to match would-be Deep Learning educators with students and teachers who have already gone through the process is so valuable. 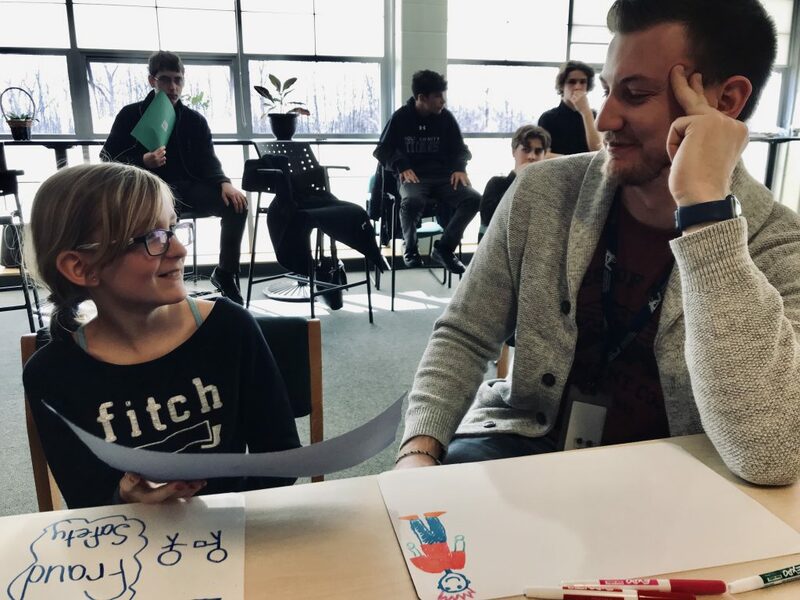 “I have been trying to implement Deep Learning into my class, but I’m still in the infancy of it, so I’m trying to learn from these students,” said Ben Clancey, a Grade 7 teacher at Good Shepherd CES. 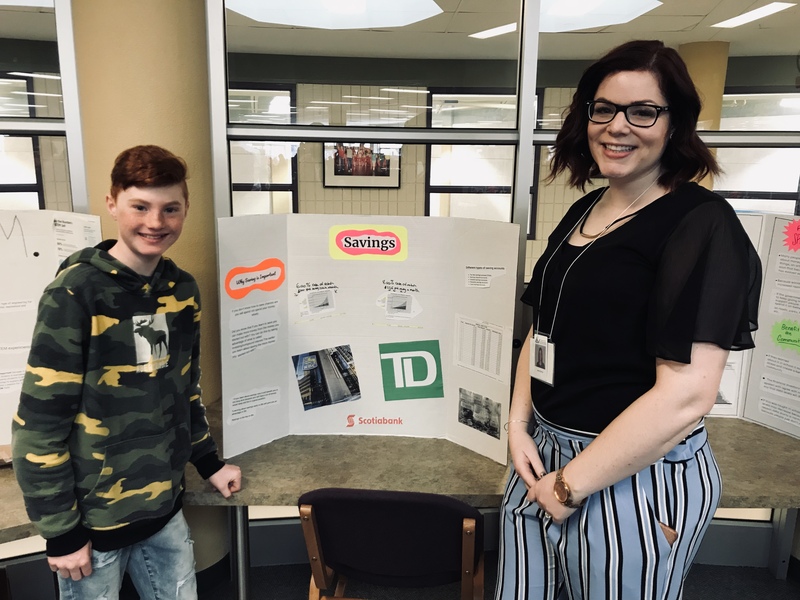 Hayden Worden, Grade 6, and his Good Shepherd CES teacher Jaime DeMille share their learning during the inaugural Deep Learning Expo at Holy Trinity Catholic Secondary School on Thursday, April 4, 2019. Hayden Worden, a Grade 6 Good Shepherd student, was on hand to explain his experience with Deep Learning as a student. “It opens you up to the community. You learn a lot more in Deep Learning than you would just opening up a textbook and reading,” he said. His teacher, Jaime DeMille, is new to Deep Learning, but her early experience has been eye opening, she said. “The changes in the students in terms of their confidence, learning skills and work habit has skyrocketed,” she said. “The excitement that my students feel for class…they’re coming to me and saying, ‘what happens when summer time comes and we can’t work on our work anymore?’ They are so excited to come to work every day.